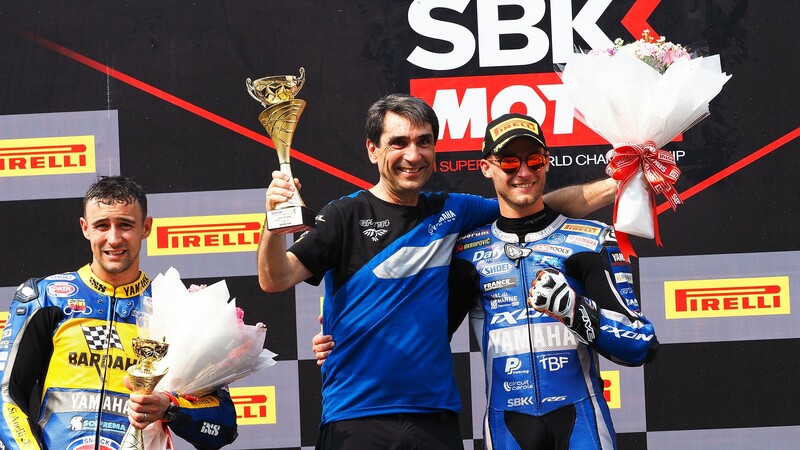 Famed for their track record in the World Endurance championship, GMT94 Yamaha returned full-time to the FIM Supersport World Championship this season. 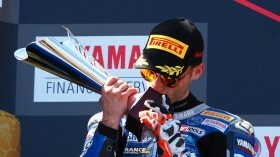 After enlisting two strong French riders to their project, the team has already tasted victory. Signing multi-time WorldSSP runner-up Cluzel was a true statement of intent for GMT94 Yamaha. Yet it would be fair to say that the all-French squad is aiming higher than second, despite being relative newcomers to the series. A race win for Cluzel at the second time of asking was a strong start, but how will the team fare as the WorldSBK paddock hits Europe? Christophe Guyot, GMT94 team manager, opens up to WorldSBK.com on his first impressions, expectations, and what is in store for the future. Two podiums, one win, after successful winter testing. A perfect start for GMT94? The moment you take on a challenge like this you try to push forward, because you tell yourself that it’s possible and that it will work at one moment or another. But when you win, you think it’s incredible, and that’s the paradox of what we experience. It’s true that our start has been fantastic. Australia wasn’t perfect, but Jules managed really well. He remained positive and constructive. That allowed us to grow before winning in Thailand. But let’s be realistic, Phillip Island and Buriram are very particular rounds. You don’t win championships there, but you can lose them. We can be satisfied after finishing the fly-aways with a good handful of points. Jules Cluzel has immediately taken on the role of title contender, could we already say that the Bardahl Evan Bros. WorldSSP Team will be your main rivals this year? There will be others. We know that Krummenacher and Caricasulo are usually fast in the early stages of the season. It was not a surprise. There are also other riders such as Thomas Gradinger who keeps on growing, Isaac Viñales, or even Hikari Okubo, he’s started doing things with that Kawasaki that he couldn’t last year. All of them could surprise us. Then there’s Lucas Mahias, he’ll eventually find his form, it’s a certainty. We’re definitely not alone! And the MV Agustas or Hondas? I’ll be honest, before Australia we had Raffaele De Rosa down as our most dangerous rivals because of the new rulebook. It hasn’t played out that way up to now, but there’s still a long way to go. There are eight races in Europe and another two overseas which will be key. The MV Agusta will clearly be in the mix. As for the Hondas, there’s no reason why they can’t be in the mix with good riders. Hannes Soomer or Jules Danilo can achieve great things. How have the new rules affected you? The electronics are the same for everyone. On top of that, the Yamaha’s engine speed has been slightly reduced. Without going too into detail, the other manufacturers will benefit from more concessions to be closer. But the engine power is more or less the same all around. If Cluzel is gunning for the title, what are Corentin Perolari’s goals? Corentin has done nothing but discover new tracks since the end of last season. We could say that he’s been fortune because he’s already sixth in the standings, despite having two difficult races. Like in Buriram, he had the worst luck at the start rolling over Badovini’s bike. Perolari has the same bike as Jules, we’re giving him time. He’ll benefit from Jules experience and the atmosphere is great. I think that from Aragon onwards, Corentin will be around the top five or seven, I’m absolutely convinced. He still needs to work on his qualifying, he might put too much pression on himself… He’ll get there, he needs time. He’s still just 20 years old and his future is in his hands. It’s early days, but seasons go by quickly: has GMT94 considered competing in the other series, WorldSBK, WorldSSP300 or even the ESS Cup? The answer is very simple: we can consider anything else once we’re World Champions. We have a structure that must focus on winning the title. We also look to give a young rider the chance to reach the podium. Nothing will change until we meet these goals. Follow GMT94 Yamaha’s performance at MotorLand Aragon thanks to WorldSBK VideoPass.